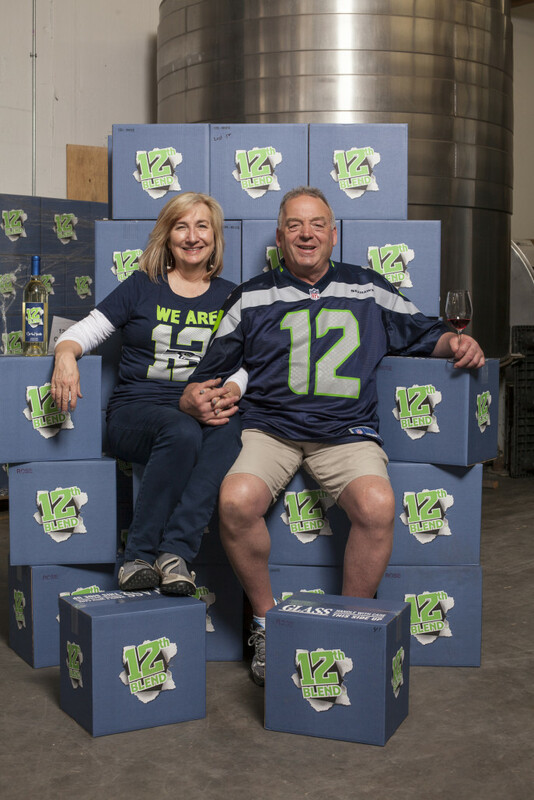 WOODINVILLE, Wash.–The 12th Blend, a new label by Eye of the Needle winery, has found strong support among the Seahawks’ so-called 12th Man, which, in turn, is paying big dividends to Northwest Harvest, a statewide, non-profit hunger relief agency. “For every bottle we sell, we’re able to donate two meals,” said Lauren Bullock, co-owner of Eye of the Needle with her husband Bob Bullock. In 2014 their goal was to sell 4,000 cases of 12th Blend and thus fund nearly 100,000 meals. 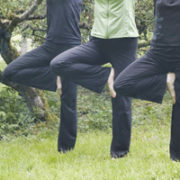 It seemed an ambitious goal at the time, but they reached it well before the end of the year. Their eye-catching, blue and green 12th Blend label is popping up on grocery shelves all over Washington. “It’s gotten us additional exposure and more people statewide are starting to realize just how good our wine is,” said Bob Bullock. What makes 12th Blend particularly exciting as a new label is that it highlights what Eye of the Needle is particularly good at: blending a combination of premium wines that they buy from other wineries into a finished product that is both extraordinary and affordable and is a contender at local & national competitions. 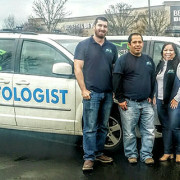 “We have been able to blend wines for every occasion,” Bob said, from weddings to tailgate parties and everything in between. Still, in their various advertising or marketing materials, they had never ‘owned’ their role as master blenders. 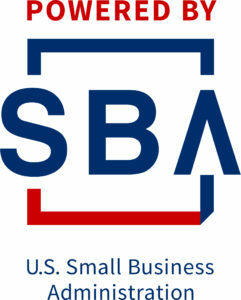 A few days before the 2014 Super Bowl they met with Steve Burke, a certified business advisor with the Washington Small Business Center (SBDC) and their marketing strategy discussion. Eye of the Needle had been earning critical acclaim and a loyal following in Western Washington, but at the meeting with Burke, the Bullocks talked about their plan to cast a wider net. 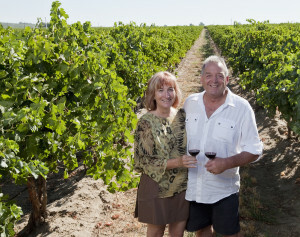 “I was trying to come up with an idea that would give us more business throughout the state,” Bob said, “something everyone could relate to.” According to Lauren, Steve suggested that they brand themselves as “master blenders” and ‘own’ the blended wine market. As master-blenders, the Bullocks bottled more than 4,000 cases of wine in 2013. While they do crush their own grapes, most of what they produce comes from buying premium wine from other wineries and then blending and finishing it to create high-quality, price-driven wines that range between $10 and $25. Their wines are sold at a growing list of retail shops, including Albertsons, Safeway, Whole Foods, Central Markets, Esquin Wine Merchants, Total Wine, QFC, Wine World and Bartels. And, the more he thought about it, the more he saw a connection between the 12th Man and the charitable work he and Lauren have long been involved in. “Giving back is part of what we do,” Lauren said. 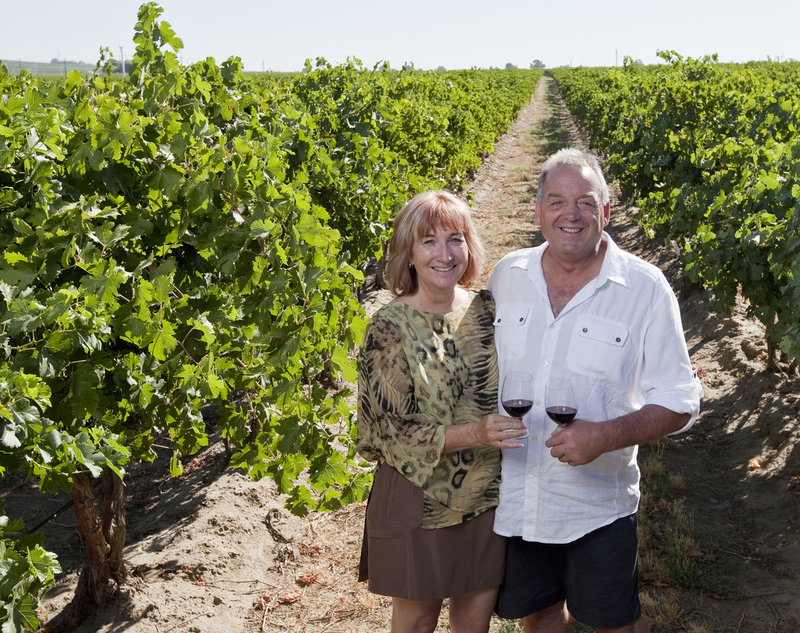 Over the next few months they created three wines: Chenin Blanc, Red Wine and 2013 Rose of Merlot. They bottled 1,100 cases in June and were sold out in two weeks. “We have been trying to catch up ever since,” Lauren said. They bottled again in August, September and October, and the cases again flew out of their warehouse. The addition of 12th Blend has doubled their wine production for 2014, a transition that has been hectic, but not chaotic. 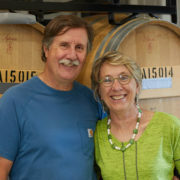 “Steve has been an invaluable team player in the development of our winery, helping us navigate through the twists and turns of the business,” Lauren said.